My temblor knocked the picture of my mother-in-law off the wall. I don't want to ruin my marriage. 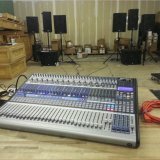 I just bought a Temblor T8 (sounds amazing) but I don't know how to set the level relative to my Eris 4.5. The user manual told me to get the level of the monitors up until it reaches 85db of loudness using an SPL, and the same with the Temblor until it reaches 79db SPL. However 85db is way to loud for me (Ahem, neighbors...), so I set the Eris to 70db SPL. My problem is that I don't know what is the relative level of db SPL to this for the Temblor T8. I thought 50db was, but it still caused an earthquake in Japan. Could anybody tell me what to do? Also, can you tell me whether I should set the High Pass filter or not, and if so, to which frequency? This will give you some insight into how to set up your speakers. Which input do I use on the Temblor if the output of my system is a single cable? Why does the light on the front of my Temblor T8 subwoofer turn to white? Why are the feet of my Temblor subwoofer shaped like cones? Can I plug different signals into each input of the Temblor? Hum in audio coming out of Temblor T8, what's going on? Where can I find the manual for the Temblor? How do I connect Ceres BT Speakers to a Temblor Subwoofer?